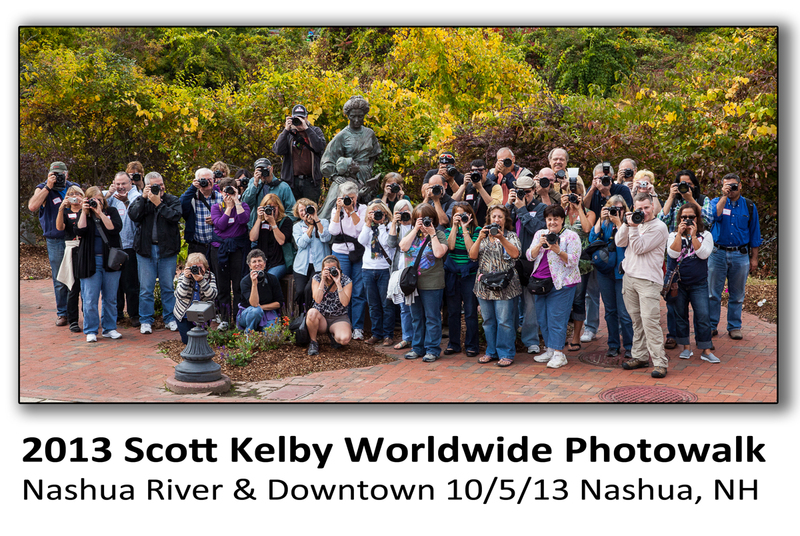 On Saturday Oct. 5, it was my distinct pleasure to lead a group of photographers in Nashua, NH for the 6th annual Scott Kelby Worldwide Photowalk. 45 photographers of all skill levels joined me for a photographic exploration of the historic mill-yard district along the banks of the Nashua, River. We were part of a global photography event. More than 28,000 photographers in over 1200 locations around the planet went out to capture a single day with their cameras! My group that explored Nashua was mix of locals and folks from all over New England. It was nice mix of my past photo workshop students and many new faces. What I found most interesting was the unique viewpoint each photographer had of the common space and moment. I am looking forward to seeing the photography they created during this photography event. Even though we were walking down the same streets at the moment , the photography will be just as varied as the people in our group. This entry was posted in Photo Workshops, Photographer Events and tagged learn photography, Nashua, New Hampshire, NH, photo workshop, photography event, worlwide photowalk on October 7, 2013 by DSphoto.